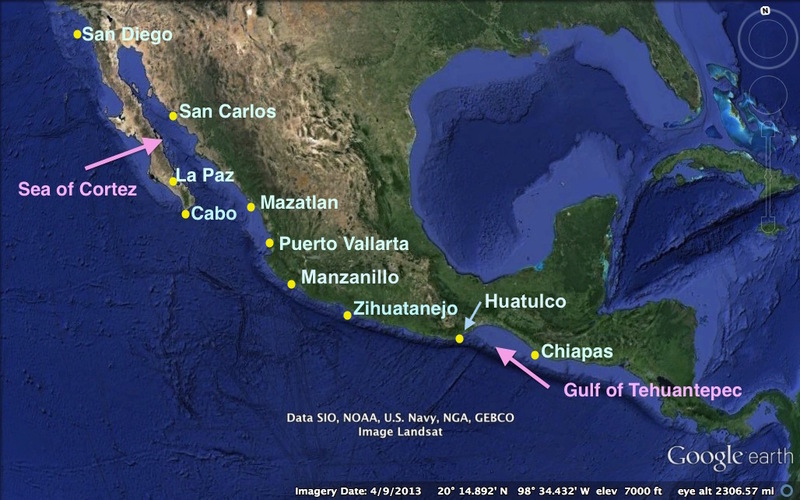 We cruised Pacific Mexico in our 2008 Hunter 44DS sailboat named Groovy between January, 2010 and July, 2013. All of our blog posts from the voyage can be found under the MEXICO menu item at the top of the page, grouped by region. If you would like to read the story of our voyage in the order in which it happened, here are some links to key points in the tale so you can tackle it in “chapters,” and here is a map as well. Each page of the blog is connected to the next and previous post by the blue highlighted words at the beginning and end of the text, and/or by the arrows that appear at the bottom of each post. Sailing Passages We’ll NEVER Forget! Crossing the Sea of Cortez the first time – 330 miles of Sheer Terror! Crossing the Gulf of Tehuantepec – Storms on Radar and Weird Sightings At Sea! Sometimes CRUISING means RESORT LIVING – How Cool is THAT?! We Anchor in a Stunning Bay Surrounded by Beautiful Resorts – Wow! Las Hadas Resort in Manzanillo Mexico – Fairies, Turrets and Bo Derek! Folks Kayak to Our Boat and Invite Us to Stay At their Exclusive Resort! Great places Mexico Cruisers Shouldn’t Miss! Huatulco is Pacific Mexico’s BEST KEPT CRUISING SECRET! Zihuatanejo is a Cruiser’s Delight, Second only to Huatulco! Oaxaca City is Vibrant, Artsy, Gritty and FUN!